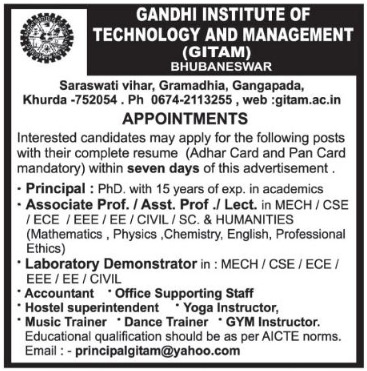 Gandhi Institute of Technology and Management, Bhubaneswar has advertised in Sambad newspaper for the recruitment of Associate Professor/Assistant Professor jobs vacancies. Interested and eligible job aspirants are requested to apply with in 7 days. Check out further more details below. About College: GITAM Institute of Technology was established under a duly registered Trust with an objective to provide high quality technical education having significant humanistic aspects.Ever since its establishment in 2008, the GITAM family has always tried to create an environment for all its technocrats to dream for a sensational career and make themselves fit enough to this globalized world. Gandhi Institute of Technology and Management (GITAM), functioning under Vidya Bikash Educational Trust has come to the limelight to provide quality, technical education to not only the students of Odisha, rather the best possible opportunity to the students, coming from the eastern part of the country also.